Completely biodegradable and vegetable-based, our Castile Liquid Soaps have been called the "Swiss-army knife" of cleaning - usable for just about any cleaning task. These simple, ecologically formulated soaps are gentle enough for washing body, face or hair, but also powerful enough for tasks like dishwashing, mopping, laundry and even pest control. Different tasks call for different dilutions of the soap. Dr. Bronner’s continues its mission and commitment to building an engine for promoting and advancing positive social change. From pioneering USDA certified organic personal care products, to creating Fair Trade projects across the world that ensure fair and just treatment of farmers and workers, to creating a socially responsible workplace here in the U.S., we strive to honor our heritage with progressive business practices, while devoting profits to worthwhile causes and charities worldwide. Dr. Bronner’s Pure-Castile Liquid Soap Value Pack – Lavender 32oz. (2 Pack) Scented with pure lavender and lavandin oils to calm the mind and soothe the body! Dr. Bronner’s Pure-Castile Lavender Liquid Soap is concentrated, biodegradable, versatile and effective! Dr. Bronner’s is synonymous with Old World quality and time-honored simplicity. Their soaps, renowned for their quality, versatility and eco-friendliness, are completely biodegradable, vegan, and certified USDA Organic. With a commitment to the environment, the plastic cylinder bottles are made from 100% post-consumer recycled (PCR) plastic. Their liquid soaps are three times more concentrated than most so-called “liquid soaps” on the market, which makes them environmentally and economically responsible. 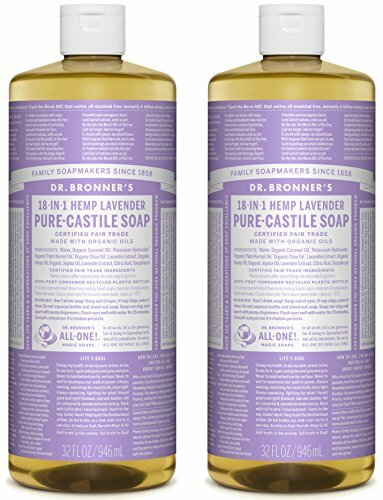 Dr. Bronner’s Liquid Pure-Castile multi-use soaps are gentle enough for your skin, but powerful enough for household cleaning. 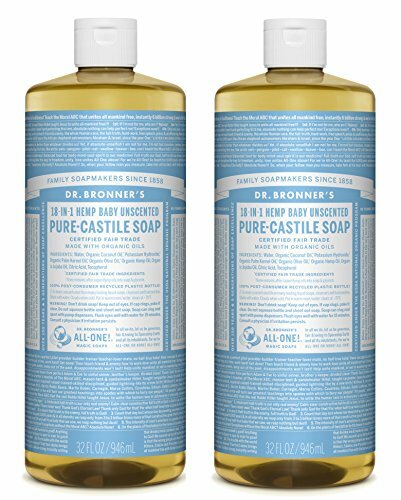 Dr. Bronner's Pure-Castile Liquid Soap - Baby Unscented 32oz. Dr. Bronner's Pure-Castile Liquid Soap Value Pack - Baby Unscented 32oz. (2 Pack) With no added fragrance and double the olive oil, our Baby Unscented Pure-Castile Liquid Soap is good for sensitive skin – babies too (though not tear-free!) Dr. Bronner’s is synonymous with Old World quality and time-honored simplicity. Their soaps, renowned for their quality, versatility and eco-friendliness, are completely biodegradable, vegan, and certified USDA Organic. With a commitment to the environment, the plastic cylinder bottles are made from 100% post-consumer recycled (PCR) plastic. Their liquid soaps are three times more concentrated than most so-called “liquid soaps” on the market, which makes them environmentally and economically responsible. Dr. Bronner’s Liquid Pure-Castile multi-use soaps are gentle enough for your skin, but powerful enough for household cleaning. 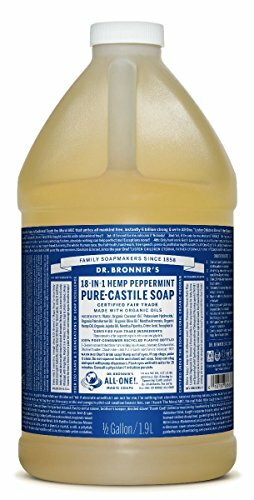 Dr. Bronner's Pure-Castile Liquid Soap - Peppermint 64oz. Dr. Bronner's most popular scent – with a peppermint burst so pure it tingles! Scented with organic peppermint oil to cool skin, clear sinuses and sharpen mind. This Peppermint Pure-Castile Liquid Soap is concentrated, biodegradable, versatile and effective. Made with organic and certified fair trade ingredients, packaged in a 100% post-consumer recycled bottle. All-One! Dr. Bronner's is synonymous with Old World quality and time-honored simplicity. Our soaps, renowned for their quality, versatility and eco-friendliness. Dr. Bronner's Pure-Castile Bar soap is completely biodegradable, vegan, and certified USDA Organic. With a commitment to the environment, our wrappers are made of 100% post-consumer recycled materials. Our bar soaps are hyper concentrated, which makes them environmentally and economically responsible. 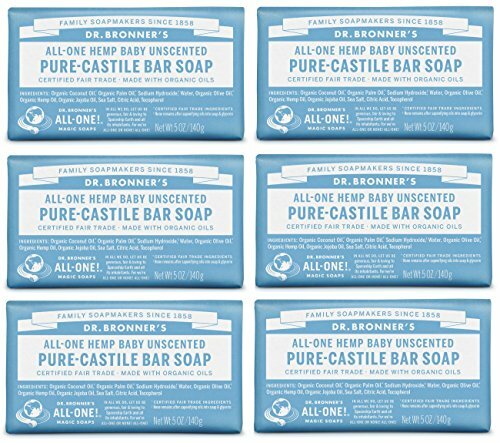 Dr. Bronner's Pure-Castile Bar Soaps are gentle enough for your skin, but powerful enough for household cleaning. With no added fragrance and double the olive oil, our Baby Unscented Pure-Castile Bar Soap is good for sensitive skin – babies too (though not tear-free!). Dr. Bronner’s Bar Soap is made with certified fair trade ingredients and organic hemp oil for a soft, smooth lather that won’t dry your skin. 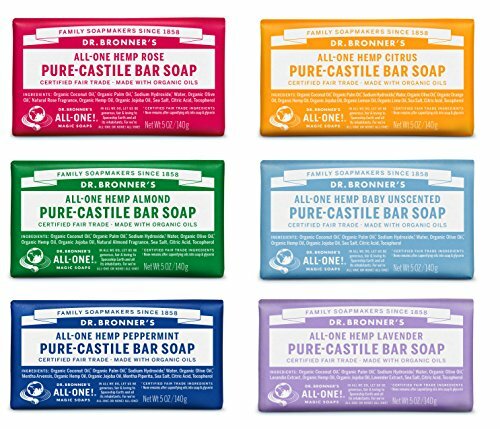 Dr. Bronner’s Pure-Castile Bar Soaps are biodegradable-vegan, gentle and versatile, good for washing body, face or hair! Enjoy only 2 cosmetics, enough sleep & Dr. Bronner’s Magic Soaps to clean-body-mind-soul-spirit instantly uniting One! All-One!! INGREDIENTS: Organic Coconut Oil*, Organic Palm Oil*, Sodium Hydroxide**, Water, Organic Olive Oil*, Organic Hemp Oil, Organic Jojoba Oil, Sea Salt, Citric Acid, Tocopherol *CERTIFIED FAIR TRADE INGREDIENTS ** None remains after saponifying oils into soap & glycerin. 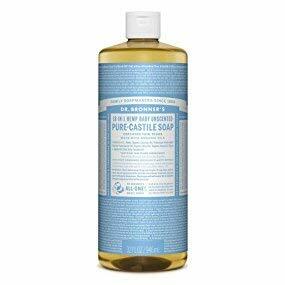 Dr. Bronner's Pure-Castile Liquid Soap - Baby Unscented, 32oz. Dr. Bronner's Unscented Baby-Mild Castile Liquid Soap contains no fragrance and replaces it with double the olive oil, so it is great for people with allergies or sensitive skin. Of course, it is great for babies as well! All soaps are certified organic under the USDA National Organic Program. All soaps are also certified Fair Trade. Packaged in 100% post-consumer recycled (PCR) plastic bottles. Completely biodegradable and vegetable-based, our Castile Liquid Soaps have been called the "Swiss-army knife" of cleaning - usable for just about any cleaning task. These simple, ecologically formulated soaps are gentle enough for washing body, face or hair, but also powerful enough for tasks like dishwashing, mopping, laundry and even pest control. INGREDIENTS: Water, Organic Coconut Oil*, Potassium Hydroxide**, Organic Palm Kernel Oil*, Organic Olive Oil*, Organic Hemp Oil, Organic Jojoba Oil, Citric Acid, Tocopherol *CERTIFIED FAIR TRADE INGREDIENTS ** None remains after saponifying oils into soap & glycerin. 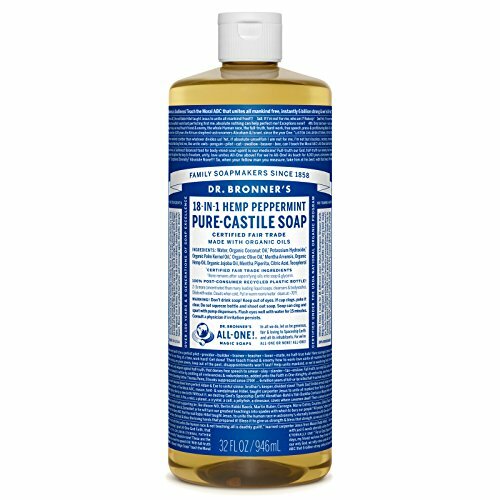 Dr. Bronner's Pure-Castile Liquid Soap-Peppermint (2, 4, 8, 16, 32oz)- You Pick! Dr. Bronner's Pure-Castile Liquid Soap - Lavender (8, 16, 32oz) - YOU PICK !! Want more Bronner Castile Soap similar ideas? Try to explore these searches: 4 Half Round Hearth Rug, Quarts Side Press, and Turquoise Green Czech Seed.